Powerful Digital Marketing Course - Get the Competitive Edge! Attract and Engage! This leading-edge digital marketing training course and qualification (Certificate in Online Business™), will help you develop and implement a powerful digital marketing strategy, maximise your sales and enhance your brands reputation. The COB Certified Digital Marketing Manager Program is a high-quality consultative digital marketing course delivering expert insights and powerful hands-on workshops. You will experience a real-world approach to learning, and apply it to your projects - both in real-time and after the course. The small sized classes enable focus on you and your projects. 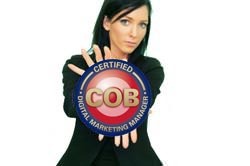 The COB Certified Digital Marketing Manager Program is offered exclusively as a classroom course. It is currently delivered as an on-site only course by our expert training & enablement team. We also work with recognised professional organisations around the globe who license and deliver our globally established industry-recognised certification programs.